The interplay between innate and adaptive immunity is important in multiple sclerosis (MS). The inflammasome complex, which activates caspase-1 to process pro–IL-1β and pro–IL-18, is rapidly emerging as a pivotal regulator of innate immunity, with nucleotide-binding domain, leucine-rich repeat containing protein family, pyrin domain containing 3 (NLRP3) (cryopyrin or NALP3) as a prominent player. Although the role of NLRP3 in host response to pathogen associated molecular patterns and danger associated molecular patterns is well documented, its role in autoimmune diseases is less well studied. To investigate the role of NLRP3 protein in MS, we used a mouse model of MS, experimental autoimmune encephalomyelitis (EAE). Nlrp3 expression was elevated in the spinal cords during EAE, and Nlrp3−/− mice had a dramatically delayed course and reduced severity of disease. This was accompanied by a significant reduction of the inflammatory infiltrate including macrophages, dendritic cells, CD4, and CD8+ T cells in the spinal cords of the Nlrp3−/− mice, whereas microglial accumulation remained the same. Nlrp3−/− mice also displayed improved histology in the spinal cords with reduced destruction of myelin and astrogliosis. Nlrp3−/− mice with EAE produced less IL-18, and the disease course was similar to Il18−/− mice. Furthermore, Nlrp3−/− and Il18−/− mice had similarly reduced IFN-γ and IL-17 production. Thus, NLRP3 plays a critical role in the induction of the EAE, likely through effects on capase-1–dependent cytokines which then influence Th1 and Th17. Multiple sclerosis (MS) is a devastating disease that currently affects seven million people worldwide (1). Experimental autoimmune encephalomyelitis (EAE) is one of the most widely used animal models to study MS (2, 3). The basis of the development of EAE is the induction of T cell autoreactivity to Ags within the CNS. The CD4+ IFN-γ–secreting Th1 and IL-17–secreting Th17 cells have been frequently associated with EAE and MS pathology (4, 5). The development of the autoreactive T cells is largely determined by their cytokines milieu. The differentiation of Th1 and Th17 cells are influenced by cytokines produced by the innate immune system. The cytokines IL-1β, IL-12, IL-18, and IFN-γ promote Th1 response, whereas IL-1β, IL-6, and TGF orchestrate Th17 response (6, 7). Proinflammatory cytokines are predominantly produced by the innate immune system through the activation of a battery of pathogen pattern recognizing receptors, which include TLRs, RNA helicases, and lectin receptors. Nucleotide-binding domain, leucine-rich repeat containing protein (NLR) is a group of intracellular proteins that regulate host inflammatory response (8). A subset of NLR proteins center on the proteolytic cleavage of procaspase-1 through the formation of a macromolecular complex termed the inflammasome (9). Activation of caspase-1 results in the cleavage and maturation of the IL-1β, IL-18, and several other target proteins. Among the NLR proteins, NLR family, pyrin domain containing 3 (NLRP3)-dependent inflammasome activation has the broadest specificity (10–12). Mutations within the NLRP3 gene are associated with a spectrum of autoinflammatory disorders, known as the familial cold autoinflammatory syndrome marked by fever, skin urticaria, arthralgia, hearing loss, renal amyloidosis, severe arthropathy, and neurologic deficits (13, 14). To assess the role of NLR protein in a T cell-mediated autoimmune disorder, we sought to test the hypothesis that a disruption of inflammasome signaling ameliorates the autoimmune response to CNS Ag in the EAE model. By using the Nlrp3-deficient (Nlrp3−/−) mice, we specifically examined the role of the NLRP3-dependent inflammasome in the development of EAE. We found that the Nlrp3−/− mice are resistant to the development of EAE. This resistance is due to the decrease of Th1 and Th17 responses specific to brain autoantigens. Our results indicate that NLRP3 regulates Th1 and Th17 responses and plays an important role in T cell-mediated autoimmunity. Nlrp3−/− mice were provided by Millennium (Cambridge, MA), Caspase-1−/− mice by Dr. R. Flavell (Yale University, New Haven, CT), and Il18−/− mice from The Jackson Laboratory (Bar Harbor, ME) (15). Knockout mice were backcrossed onto C57BL/6 background for at least nine generations. 2D2 TCR transgenic mice and C57BL/6 mice were purchased from The Jackson Laboratory. All protocols and procedures were approved by the University of North Carolina at Chapel Hill Animal Care and Use Committee. Myelin oligodendrocyte glycoprotein (MOG)-induced EAE using the MOG35–55 peptide was performed as described previously (16). Animals were scored daily by two independent investigators. Animals were perfused with PBS and 4% formaldehyde (Sigma-Aldrich, St. Louis, MO). Spinal cords were embedded in paraffin and cut into 5-μm sections, and after dehydration, tissue sections were incubated with primary antiglial fibrillary acidic protein (GFAP) (Dako, Carpinteria, CA) and anti-myelin basic protein (MBP) Abs, followed by FITC-conjugated secondary (Vector Laboratories, Burlingame, CA). The images were collected using Olympus microscope and camera (DEI Optronic Engineering, Goleta, CA). Cells were washed in PBS/2% FBS, blocked using Fc blocker (BD Pharmingen, San Diego, CA), and incubated with Abs to CD45, CD11b, CD11c, I-Ab, CD3, CD4, CD8, CD44, CD62L, and CD19 (BD Pharmingen). The intracellular stain was performed using Cytofix/Cytoperm kit (BD Biosciences) with anti–IL-17A and anti–IFN-γ Abs (BD Pharmingen). Fluorescence intensities were acquired using CyAn ADP high-resolution cytometer (Dako). Spinal cords were harvested after PBS perfusion. They were homogenized in buffer containing 50 mM Tris-HCl (pH 7.4), 150 mM NaCl, 2 mM EDTA, 1% Nonidet P-40, and 0.1% SDS. Samples were separated on a 12% polyacrylomide gel, transferred onto polyvinylidene difluoride (Millipore, Bedford, MA) membrane, and blocked with PBS containing 10% nonfat milk and 0.05% Tween 20 (Sigma-Aldrich). Primary Abs to MBP-, GFAP-, actin-, or GAPDH- and HRP-conjugated secondary Abs were used. The signal was visualized using a Chemiluminescence kit (Pierce Chemical, Rockford, IL). Lymph node cells were stimulated with MOG35–55 peptide (40 μg/ml) for 12 h. Total RNA was isolated with the RNeasy plus mini total RNA isolation kit (Qiagen, Valencia, CA). cDNA was synthesized with Superscript III reverse transcriptase (Invitrogen, Carlsbad, CA). Real-time PCR was performed with an ABI Prism 7700 Sequence Detection System (Applied Biosystems, Foster City, CA) and with ABsolute Blue SYBR Green ROX mix (ABgene, Surey, U.K.). The primer sense/antisense sequences are IFN-γ, 5′-TCAAGTGGCATAGATGTGGAAGAA-3′/5′-TCAAGTGGCATAGATGTGGAAGAA-3′; IL-17A, 5′-TCAAGTGGCATAGATGTGGAAGAA-3′/5′-ACACCCACCAGCATCTTCTC-3′; IL-4, 5′-GGCATTTTGAACGAGGTCACA-3′/5′-GACGTTTGGCACATCCATCTC-3′; and HPRT, 5′-AGCCTAAGATGAGCGCAAGT-3′/5′-TTACTAGGCAGATGCCCA-3′. Samples were normalized to the internal control HPRT. Relative expression was calculated with the ΔΔCt method (17). Cytokines were quantified using IFN-γ, IL-17A (BioLegend, San Diego, CA), and IL-1β ELISA (BD Pharmingen) and a Multiplex Array for IFN-γ, IL-17Α, IL-13, IL-12, IL-6, MCP1, and TNF-α (BioLegend). An IL-18 ELISA was conducted using the anti–IL-18 monoclonal clone 74 (MBL) and biotinylated anti–IL-18 clone 93-10C (MBL, Naka-ku Nagoya, Japan). The results are expressed as mean ± SE. Statistical significance was determined by the Student t test or by two-way ANOVA, followed by Tukey posthoc test to analyze clinical scores. Statistical significance was accepted at p < 0.05. Nlrp3 is primarily expressed in myeloid cells including APCs and is critical in the production of cytokine IL-1β and IL-18 (9, 11). Both of these cytokines have significant influence on the differentiation of Th cells. Therefore, we sought to study the influence of Nlrp3 on T cell function. To delineate contribution of different subsets of APCs to the differentiation of T cells in Nlrp3−/− mice, we first evaluated Nlrp3 in splenic dendritic cells (DCs) and macrophages. Nlrp3 was expressed by macrophages and DCs isolated from naive as well as animals that were immunized for 3 d. We also tested Nlrp3 expression in different subsets of DCs and found that CD8− and CD8+ myeloid DCs express Nlrp3, whereas plasmacytoid DCs express little Nlrp3 (Fig. 1A). To test the effect of Nlrp3 on T cell activation, we first immunized wild-type (WT) and Nlrp3−/− mice with OVA emulsified in CFA. Nine days postimmunization, we harvested spleens, restimulated them with OVA, and examined Th1 T cell response. ELISPOT assay showed a significant reduction in the number of IFN-γ+ cells in Nlrp3−/− mice (Fig. 1B). These results were confirmed by IFN-γ ELISA (Fig. 1C) and by flow cytometry of IFN-γ intracellular staining (Fig. 1D). Intracellular cytokines staining showed reduction in IL-17 (Fig. 1E). These findings indicate that proper Nlrp3 expression is required for Th1 and Th17 development in vivo. We also investigated the possibility that T cells from Nlrp3−/− mice have an internal proliferative defect. Plate-bound anti-CD3/anti-CD28 were used to stimulate CFSE-labeled CD4+ T cells, and Nlrp3−/− and WT T cells responded similarly indicating normal T cell proliferative property between these two strains (Fig. 1F). These data prompted us to further investigate how NLRP3 affects T effectors in a classical T cell-mediated disease model, EAE. Impaired CD4+ T cell responses in Nlrp3−/− mice. A, Relative expression of Nlrp3 in different subsets of APCs (pDC; Mϕ; superscript i indicates cells that were purified from spleen and lymph nodes 3 d after immunization). The calculation for relative expression was performed as described in Materials and Methods. B–D, WT and Nlrp3−/− mice (n = 3) were i.p. immunized with 100 μg OVA emulsified in CFA. Eight days postimmunization, pooled splenocytes were restimulated with OVA protein overnight. IFN-γ+CD4+ T cells were enumerated by ELISPOT assay (B), ELISA (C), IFN-γ intracellular staining (D), and IL-17 intracellular staining (E). The numbers beside the outlined areas indicate the percentage of CD4+ T cells that were IL-17 or IFN-γ+. F, Proliferation of CD4+ T cells from WT and Nlrp3−/− mice using plate-bound anti-CD3 and anti-CD28 Ab stimulation. Mϕ, macrophage; pDC, plasmacytoid DC. We evaluated the expression of Nlrp3 mRNA over the course of MOG-induced EAE by real-time PCR. The expression of Nlrp3 mRNA in the spinal cords increased during the development of the disease compared with mice that were immunized with OVA (Fig. 2A). Although there was a slight increase in Nlrp3 mRNA during the preclinical stage of the disease prior to the appearance of clinical symptoms, there was approximately a 10-fold enhancement of Nlrp3 mRNA at the peak of the disease (Fig. 2A). These findings suggest a potential role of Nlrp3 in the MOG-induced EAE. Nlrp3−/− mice have delayed course and reduced severity of EAE. A, mRNA expression of Nlrp3 in the spinal cord during the course of EAE. The label Ova represents negative controls that were immunized with OVA instead of MOG35–55; “preclin” indicates stage of the EAE before appearance of the symptoms; “peak” indicates the peak of EAE usually at the 3-wk time point. B, Clinical score of WT (▴) and Nlrp3−/− mice (▪) after immunization using MOG 35–55 in CFA. C, Clinical scores of two experiments were evaluated for 7 wk. Clinical scores were evaluated by two observers. Data represented as the mean ± SE; n = 15. Two-way ANOVA followed by Tukey’s test for multiple comparisons were used to analyze statistical differences (p < 0.05 for both B and C). To evaluate the role of Nlrp3 in the development of murine EAE, we determined the kinetics of disease onset and clinical severity in WT and Nlrp3−/− mice. The clinical symptoms of EAE appeared in the WT mice at day 7 after the initial immunization, whereas no clinical signs were noted in Nlrp3−/− mice until day 13. The maximum clinical score at the peak of the disease (day 24) was significantly lower in Nlrp3−/− compared with WT mice (Fig. 2B). In two additional experiments, mice were observed up to 7 wk after immunization. Clinical scores in Nlrp3−/− mice were significantly lower even at this advanced stage of the EAE (Fig. 2C). The progression of EAE correlates with the degradation of the myelin sheath that leads to the deficit of axonal conduction and appearance of clinical symptoms. Accordingly, we quantified the amount of myelin in the spinal cords of EAE mice at the peak of the disease using immunohistochemistry and immunoblotting for MBP. Nlrp3−/− mice retained significantly (2-fold) more myelin in the spinal cord compared with WT mice 3 wk after immunization (Fig. 3A, 3B). Immunohistochemistry revealed that the most prominent preservation of myelin MBP occurred in the periphery of the spinal cord (magnification ×40 and ×200 [inset]; Fig. 3A). The milder clinical scores observed in Nlrp3−/− mice were in agreement with the preservation of myelin in the ventral funiculus of the white matter (Fig. 3A). In addition, the overall content of MBP in spinal cord homogenate as measured by Western blotting showed a two times increase in Nlrp3−/− mice over WT mice (Fig. 3B). Spinal cords from Nlrp3−/− mice have more myelin and less astrogliosis compared with WT animals following EAE induction. A, Sections of the lumbar spinal cord from WT (i, iii) and Nlrp3−/− (ii, iv) mice stained with anti-MBP Ab. The calibration bars are 200μm in i and ii (original magnification ×40) and 50 μm in iii and iv (original magnification ×500). B, Western blot of spinal cord homogenates from WT and Nlrp3−/− mice probed with anti-MBP Ab (inset) and the corresponding quantitation of Western blots are shown. C, Sections of the lumbar spinal cord from WT (i, iii) and Nlrp3−/− (ii, iv) mice stained with anti-MBP Ab. The calibration bars are 200 μm in i and ii (original magnification ×40) and 50 μm in iii and iv (original magnification ×500). D, Western blot of spinal cord homogenates from WT and Nlrp3−/− mice probed with anti-GFAP Ab (inset) and the corresponding quantitation of Western blots are shown. Data are shown as mean ± SE; n = 4; results are representative of two experiments. Statistical significance was measured using Student t test; *p < 0.05. Neuroimmune diseases such as EAE are accompanied by inflammation in the cord that drives extensive proliferation of the astrocytes, termed gliosis (18). Spinal cords from Nlrp3−/− mice showed significantly lower degree of gliosis after a 3-wk course of EAE as assessed by immunohistochemistry using an Ab against the astrocytic cell marker GFAP (Fig. 3C, 3D). More intense staining was observed at the outer white matter in WT mice than Nlrp3−/− mice (magnification ×40 and ×200 [inset]; Fig. 3C). The area of intense GFAP staining (Fig. 3C) correlated with a weaker myelin stain (Fig. 3A). Western blot analysis of spinal cord homogenates showed a higher degree of expression of the GFAP in WT compared with Nlrp3−/− mice (Fig. 3D), suggesting a role of Nlrp3 in inflammation that leads to gliosis. The data accumulated thus far indicate that Nlrp3 plays an essential role in EAE development. Among the major causes of the initiation and progression of EAE is proliferation and differentiation of the proinflammatory autoreactive T cells. The candidate contributors to EAE pathology are Th1 or IFN-γ–secreting CD4+ T cells and Th17 or IL-17–secreting CD4+ T cells (19). To explore the impact of Nlrp3 on the development of pathogenic Th cells subsets, we isolated draining lymph nodes from mice undergoing EAE and restimulated them ex vivo with MOG35–55 peptide for 4 h. Then we measured IFN-γ and IL-17 secretion of MOG-specific CD4 T cells by intracellular staining. Upon Ag restimulation, the frequency of IFN-γ–secreting CD4+ T cell in the draining lymph nodes of Nlrp3−/− mice were markedly reduced (>3-fold) compared with that of WT mice (Fig. 4A). Similarly, the frequency of IL-17–secreting CD4 T cells was significantly decreased (by 2-fold) in Nlrp3−/− mice (Fig. 4B). IFN-γ and IL-17 levels in supernatant obtained from cell culture established in parallel were measured by intracellular staining. High levels of IFN-γ and IL-17 were found in the presence of MOG35–55 in culture supernatants derived from WT mice (mean of 6300 ± 72 and 2000 ± 53 ng/ml, respectively), whereas cytokine levels in cultures from Nlrp3−/− mice were substantially lower (2200 ± 400 and 50 ± 20 ng/ml, respectively) (Fig. 4C, 4D). The mRNA levels of IFN-γ and IL-17A were also significantly decreased in Nlrp3−/− cells when compared with WT cells (Fig. 4E, 4F). To further delineate mechanism of Nlrp3-mediated Th1/Th17 responses, we used MOG35–55 TCR transgenic animals (2D2 mice). We evaluated naive CD4 2D2 T cell responses to MOG35–55 pulsed splenic APCs from WT and Nlrp3−/− mice. Similarly to T cell responses in immunized animals, in vitro stimulation of 2D2 T cells resulted in defective proinflammatory responses when APCs from Nlrp3−/− mice were used. Flow cytometric analysis of intracellular staining also showed a profound decreases in Th1 (Fig. 4G) and Th17 (Fig. 4F) responses to MOG35–55 but not the negative control Ag, OVA. Ag-specific stimulation induced more proinflammatory cytokines in lymph node cell cultures from WT than Nlrp3−/− animals. Flow cytometry plots and the corresponding quantitation of IFN-γ–positive (A) and IL-17–positive (B) activated T cells in WT and Nlrp3−/− splenocytes 4 wk after EAE induction stimulated ex vivo with MOG35–55. Amount of IFN-γ (C) and IL-17(D) in the supernatants of ex vivo-stimulated splenocytes analyzed by ELISA. Induction of IFN-γ (E) and IL-17 (F) mRNA in ex vivo-stimulated splenocytes. G and H, MOG35–55-specific CD4+ T cell response in the context of APCs from WT or Nlrp3−/− mice: naive CD4+ T cells from 2D2 mice were cocultured with MOG 35–55-pulsed APCs from WT or Nlrp3−/− mice. OVA was used as a negative control Ag. Intracellular staining of IFN-γ (G) and IL-17 (H) in 2D2 T cells are shown. Data are representative of two experiments performed by two independent researchers. Data are shown as the mean ± SD of n = 5; results are representative of at least four experiments. *p < 0.05; Student t test; statistically significant difference relative to controls. One of the hallmarks of a CNS inflammatory response is the infiltration of leukocytes into inflamed CNS tissues (16), and IL-17 is reported to exert a profound effect on cellular infiltrate into the CNS in the EAE model (20). We first evaluated the infiltration of macrophages and DCs into the spinal cord by flow cytometry. The surface cell marker differences between infiltrating macrophages and resident microglia can be distinguished by the level of CD45 expression (21, 22). CD45hi cells are designated as macrophages and CD45lo cells are considered as microglia. CD11c is used to identify DCs. Spinal cords of WT mice had ∼3-fold more CD11b+CD45hi macrophages (Fig. 5A) and 1.5-fold more CD11c+,MHCII+ DCs than that of Nlrp3−/− mice (Fig. 5B). The amount of CD11b+CD45lo microglia was similar in both strains of mice (Fig. 5A). This result suggests that NLRP3 regulates the accumulation of macrophages and DCs at the neuroinflammatory sites but does not affect microglia accumulation that arises endogenously within the CNS. We also evaluated the infiltration of T cells into the spinal cord at the peak of the disease. CD8 (Fig. 5C) and CD4 (Fig. 5D) T cell infiltration into the spinal cords was also significantly reduced in Nlrp3−/− mice compared with that of WT animals. This is in agreement with previous analysis of Il17−/− mice in the EAE model where the lack of IL-17–reduced CNS cellular infiltrate (20). Infiltration of macrophages, DCs, and T cells into the spinal cord postimmunization was reduced in Nlrp3−/− animals. Representative flow cytometry histogram of cells from spinal cords describing the infiltration of Mg and Mϕ: endogenous microglia and infiltration of macrophages (A), infiltration of DCs (B), infiltration of CD8+T cells (C), and infiltration of CD4+ T cells (D). Data are shown as the mean ± SD of n = 5. Results are representative of at least four experiments. *p < 0.01; Student t test; statistically significant difference relative to controls. Mϕ, macrophage; Mg, microglia. The inflammasome is defined by its ability to cleave and activate caspase-1 (23). Because caspase-1 is responsible for the vast majority of IL-1β/IL-18 maturation, the activity of caspase-1 can be indirectly measured by the amount of cleaved IL-1β and IL-18. We observed a significant but modest reduction of IL-18 in spinal cord homogenates (30%), although the levels of spinal cord IL-18 might be at the limit of detection. Serum IL-18 was relatively high in WT and a substantial decrease (3-fold) was observed in Nlrp3−/− mice at the peak of disease (Fig. 6A). The amount of IL-1β, measured by ELISA, in the serum and spinal cord did not differ between the different groups of animals (Fig. 6B), although the levels of both were vanishingly small. Because we observed a significant reduction of IL-18 level in Nlrp3−/− mice during the course of EAE, we compared Il18−/− mice with Nlrp3−/− mice and found that the two had a similarly reduced EAE disease course (Fig. 6C). Importantly, IFN-γ and IL-17 were both greatly reduced in Nlrp3−/− and Il18−/− mice (Fig. 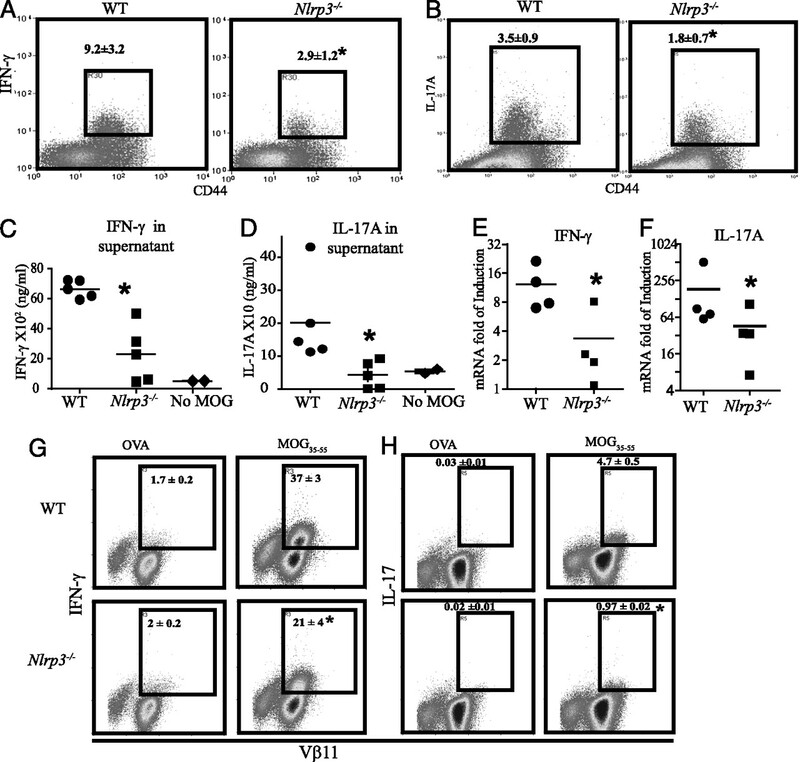 6D, 6E), whereas the level of MCP-1 was similar in WT, Nlrp3−/−, and Il18−/− mice (Fig. 6F). This indicates that the lack of IL-18 caused a reduced IFN-γ and IL-17 responses. IL-18 levels are reduced in Nlrp3−/− mice in the EAE model. A, Levels of serum and spinal cord IL-18 in WT and Nlrp3−/− mice. B, Same as A, except for levels of IL-1β. C, Progression of EAE in WT, Il18−/−, and Nlrp3−/− mice. D, IFN-γ in the spinal cords 3 wk after immunization. E, IL-17 in the spinal cords 3 wk after immunization. F, MCP-1 in the spinal cords 3 wk after immunization. Data are shown as a mean ± SD of n = 5. *p < 0.05; Student t test; statistically significant difference relative to controls. In this study, we demonstrate that the Nlrp3 gene plays a critical role in the development of EAE. 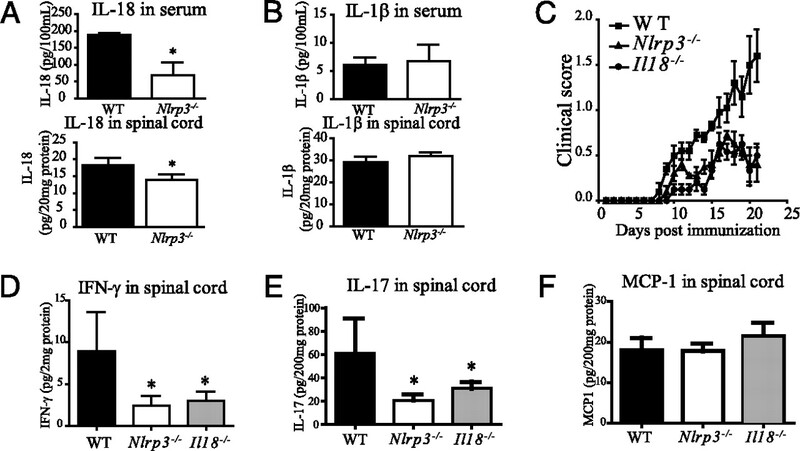 The absence of Nlrp3 resulted in diminished Th1 and Th17 encephalitogenic responses and diminished inflammatory infiltrate in the spinal cords. The reduced inflammatory response resulted in improved histopathology and reduced demyelination and gliosis in the spinal cords of Nlrp3−/− mice. Our findings are consistent with the conclusions of two very recent papers implicating a critical role of Nlrp3 in adaptive immunity (24, 25). In both reports, one allele of the mouse Nlrp3 gene was genetically replaced by a gene encoding a disease associated variant of human NLRP3. Meng et al. (25) observed that mice bearing the gain-of-function disease variants of the NLRP3 gene had profound enhancement the Th17 T cell response and its associated sequelae. Brydges et al. (24) revealed that DCs from transgenic animals drove excessive Th17 polarization and this effect was dependent on the presence of copious amount of IL-1β. Nlrp3 has also been associated with the induction of Th2-dependent Ab production in response to alum adjuvant immunization, and Nlrp3-dependent inflammasome is critical for IgE production. Two of these studies also showed that IgG1 production was also Nlrp3 dependent (26–28); however, others have failed to recapitulate these results (29). The reason for these conflicting results in IgG1 is currently unclear. Finally, it has been shown that contact hypersensitivity response is dependent on the inflammasome components, apoptosis-associated speck-like protein containing a C-terminal caspase recruitment domain CARD and Nlrp3 (30). Prior to the discovery of NLRs, the inflammasome products caspase-1, IL-1β, and IL-18 had already been reported to affect T cell responses in EAE model (31, 32). Furlan et al. (33) showed that caspase-1−/− mice had diminished severity of EAE, which corresponded with the decreased levels of IFN-γ, but IL-17 was not measured in this study. Another study showed elevated levels of activated caspase-1 in MS patients with active disease suggesting a possible link between enhanced caspase-1 and MS (34). Extensive work using gene deletion mouse lines showed that Il1β−/−, Il1α−/−, Il1αβ−/−, but not Il1Ra−/− (IL-1 receptor antagonist), alleviated EAE and T cell pathology when compared with WT controls (35). The levels of IL-17 and IFN-γ were significantly reduced in Il1αβ−/− mice but elevated in Il1Ra−/− mice (35). In another study, Il1R−/− mice were completely resistant to the induction of EAE (36). IL-1β has been shown to be important in Th17 differentiation of mouse and human naive T cells (20, 37–39). Finally, clinical studies show that MS patients with high IL-1β/IL-1Ra ratio are more susceptible to relapse (40). IL-18 was originally named as IFN-γ–inducing factor for its ability to induce IFN-γ (41). Its receptor, IL-18R, is expressed on macrophages, T cells, and NK cells. Elevated levels of IL-18 are associated with autoinflammatory diseases such as rheumatoid arthritis and systemic lupus erythematosus. IL-18 in concert with IL-12 has been reported to induce IFN-γ secretion from human effector-memory T cells (42, 43). This finding is consistent with another work demonstrating that Il18−/− mice did not develop EAE and failed to release MOG-stimulated IFN-γ (44). When rIL-18 was administrated into the Il18−/− mice, it restored the susceptibility to EAE. Similar results were found in Lewis rats where the use of anti–IL-18 neutralization Abs reduced the severity of EAE accompanied by reduced IFN-γ from Ag-stimulated T cells (45). However, there are still some controversies regarding IL-18 as another study has shown that deficiency in IL-18R rather than in IL-18 per se was important for the development of EAE (46). These conflicting findings led us to reinvestigate the role of IL-18 in EAE. Our study showed that Nlrp3−/− mice with EAE exhibited a substantial reduction of IL-18 levels but not of IL-1β, although the levels of IL-1β were at the limit of detectability. This low level of endogenous IL-1β has been noted by others and contrasts with the ease of detecting IL-1β in vitro (47). Also, we observed a reduction of IFN-γ in the spinal cord of Il18−/− mice that underwent a course of EAE. These results are in agreement with other reports that showed impaired ability of Il18−/− mice to produce IFN-γ (44). The reduction of IL-17 in Il18−/− mice was unexpected; however, recent work points to the plasticity between Th17 and effector T cells, which could account for this observation (48, 49). The experiment also showed that EAE clinical scores of Il18−/− mice are comparable to those of Nlrp3−/− animals. This indicates that reduced IL-18 observed in the Nlrp3−/− mice can lead to reduced EAE severity and reduced Th1 and Th17 cytokines. The lack of a reduction in IL-1β levels in the spinal cord and serum of Nlrp3−/− mice with EAE was surprisingly but not totally unexpected. The result suggests a mechanism where IL-1β remains relatively intact, whereas IL-18 production is reduced in Nlrp3−/− mice. Several examples in the literature suggest that IL-1β can be cleaved by a caspase-1–independent mechanism that includes caspase-8, gelatinases A and B, and bacterial enzymes-mediated cleavage (50, 51). When IL-18 and IL-1β cytokines were evaluated side by side in the same study, only IL-1β was cleaved by enzymes other than caspase-1 (52). The reduction of IL-17 and IFN-γ is likely a major underlying mechanism for the amelioration of EAE in Nrlp3−/− mice. IFN-γ and IL-17 are produced by Th1 and Th17 cells, respectively. They are key proinflammatory mediators of cellular immunity that underlie crucial pathological events during development of the EAE. Although genetic studies showed that neither IFN-γ nor IL-17 are essential for the initiation of the disease, multiple studies are in agreement that high levels of IFN-γ and/or IL-17 correlate with severity of the disease (19, 53, 54). In MS patients, elevated levels of IL-17, IFN-γ, and IL-18 were also correlated with exacerbation of the disease (55–57). Our study shows that reduced pathogenic Th1 and Th17 responses accompanied improved clinical outcome including diminished presence of macrophages and DCs in the CNS, diminished astrogliosis, and reduced loss of MBP. Reduced influx of peripheral leukocytes into the CNS has been shown to correlate with improved EAE clinical scores while increased recruitment of DCs and macrophages to the CNS aggravated EAE pathology (16, 58). In particular, one study found that decreased Th17 response resulted in decreased migration of the leukocytes into the CNS (59), which agrees with our findings. The absence of Nlrp3 did not affect the microglial population in our studies, suggesting that Nlrp3 had a predominant effect on the peripheral macrophage rather than resident microglia. This also agrees with our finding that the presence of Nlrp3 in APCs, through the cytokines that it regulates, affect the differentiation of T effector subpopulations. The lack of an obvious effect on microglia also agrees with the general consensus that EAE is predominantly a disease that is initiated by peripheral changes in autoreactive T cells. However, a more detailed analysis of microglial response is necessary to exclude a role for microglial Nlrp3 in EAE. In conclusion, this is the first report showing that the innate immune sensor, Nlrp3 has a profound effect on EAE. A working model is that upon encountering MOG in the peripheral lymphoid organs, macrophages, and DCs initiate a NLRP3-dependent IL-1β/IL-18 release. The absence of NLRP3 results in the abrogation of IL-1β and IL-18, which severely restricts the development of Th1 and Th17 response. Affected outcomes including a drop in clinical scores, astrogliosis, demyelination, and immune infiltrate in the CNS are likely explained by a reduction of IL-17 and IFN-γ production in both the peripheral lymphoid tissue and the affected CNS. This indicates that one of the functions of NLRP3 is the regulation of Th1 and Th17 responses that can markedly affect T cell-mediated autoimmunity. We thank Dr. Jill Strenjan for critical scientific discussions, Dr. Debra Taxman for revisions of the manuscript, and Drs. Coy Allen and June Brickey for help with animal experimentation. This work was supported in part by research grants from the National Institutes of Health and the National Multiple Sclerosis Society and a National Multiple Sclerosis Society Cooperative Center grant. D.G. holds a Canadian Institutes of Health Research fellowship. 2008. Atlas Multiple Sclerosis Resources in the World. World Health Organization Press, Geneva, Switzerland. 2007. Building different mouse models for human MS. Ann. N. Y. Acad. Sci. 1103: 11–18.
. 2006. A crucial role for interleukin (IL)-1 in the induction of IL-17–producing T cells that mediate autoimmune encephalomyelitis. J. Exp. Med. 203: 1685–1691.
. 2003. Transfer of severe experimental autoimmune encephalomyelitis by IL-12– and IL-18–potentiated T cells is estrogen sensitive. J. Immunol. 170: 4802–4809.
. 2007. IL-1α and IL-1β are endogenous mediators linking cell injury to the adaptive alloimmune response. J. Immunol. 179: 6536–6546.
. 2009. IL-1 acts directly on CD4 T cells to enhance their antigen-driven expansion and differentiation. Proc. Natl. Acad. Sci. USA 106: 7119–7124.
. 2008. The NLR gene family: a standard nomenclature. Immunity 28: 285–287.
. 2007. Lasting remission of a Muckle-Wells syndrome with CIAS-1 mutation using half-dose anakinra. Joint Bone Spine 74: 659.
. 2008. Cryopyrin-associated periodic syndromes and autoinflammation. Clin. Exp. Dermatol. 33: 1–9.
. 2006. Critical role for NALP3/CIAS1/Cryopyrin in innate and adaptive immunity through its regulation of caspase-1. Immunity 24: 317–327.
. 2007. Antigen presentation in the CNS by myeloid dendritic cells drives progression of relapsing experimental autoimmune encephalomyelitis. Ann. N. Y. Acad. Sci. 1103: 179–191.
. 2007. Inhibition of glial cell activation ameliorates the severity of experimental autoimmune encephalomyelitis. Neurosci. Res. 59: 457–466.
. 2005. Therapeutic efficacy of IL-17 neutralization in murine experimental autoimmune encephalomyelitis. Cell. Immunol. 237: 123–130.
. 2008. Interleukin-1β and tumor necrosis factor-α are expressed by different subsets of microglia and macrophages after ischemic stroke in mice. J. Neuroinflammation 5: 46.
. 2008. Dynamics of the inflammatory response after murine spinal cord injury revealed by flow cytometry. J. Neurosci. Res. 86: 1944–1958.
. 2008. The caspase-1 inflammasome: a pilot of innate immune responses. Cell Host Microbe 4: 198–208.
. 2009. Inflammasome-mediated disease animal models reveal roles for innate but not adaptive immunity. Immunity 30: 875–887.
. 2009. A mutation in the Nlrp3 gene causing inflammasome hyperactivation potentiates Th17 cell-dominant immune responses. Immunity 30: 860–874.
. 2008. Crucial role for the Nalp3 inflammasome in the immunostimulatory properties of aluminium adjuvants. Nature 453: 1122–1126.
. 2008. Cutting edge: inflammasome activation by alum and alum’s adjuvant effect are mediated by NLRP3. J. Immunol. 181: 17–21.
. 2008. Cutting edge: alum adjuvant stimulates inflammatory dendritic cells through activation of the NALP3 inflammasome. J. Immunol. 181: 3755–3759.
. 2009. Alum induces innate immune responses through macrophage and mast cell sensors, but these sensors are not required for alum to act as an adjuvant for specific immunity. J. Immunol. 183: 4403–4414.
. 2007. Activation of the IL-1β–processing inflammasome is involved in contact hypersensitivity. J. Invest. Dermatol. 127: 1956–1963.
. 1996. Mice deficient in IL-1β manifest impaired contact hypersensitivity to trinitrochlorobenzone. J. Exp. Med. 183: 1427–1436.
. 2001. IL-1β is essential for langerhans cell activation and antigen delivery to the lymph nodes during contact sensitization: evidence for a dermal source of IL-1β. Cell. Immunol. 211: 105–112.
. 2007. Development, cytokine profile and function of human interleukin 17-producing helper T cells. Nat. Immunol. 8: 950–957.
. 2009. Prostaglandin E2 regulates Th17 cell differentiation and function through cyclic AMP and EP2/EP4 receptor signaling. J. Exp. Med. 206: 535–548.
. 2002. Production of IL-1β and IL-1Ra as risk factors for susceptibility and progression of relapse-onset multiple sclerosis. J. Neuroimmunol. 126: 172–179.
. 1989. Endotoxin-induced serum factor that stimulates γ interferon production. Infect. Immun. 57: 590–595.
. 2009. Cytokine-induced human IFN-γ–secreting effector-memory Th cells in chronic autoimmune inflammation. Blood 113: 1948–1956.
. 1997. IGIF does not drive Th1 development but synergizes with IL-12 for interferon-γ production and activates IRAK and NFκB. Immunity 7: 571–581.
. 2000. IL-18 directs autoreactive T cells and promotes autodestruction in the central nervous system via induction of IFN-γ by NK cells. J. Immunol. 165: 3099–3104.
. 1998. Neutralizing antibodies to IFN-γ–inducing factor prevent experimental autoimmune encephalomyelitis. J. Immunol. 161: 6368–6374.
. 2006. Interleukin 18-independent engagement of interleukin 18 receptor-α is required for autoimmune inflammation. Nat. Immunol. 7: 946–953.
. 2004. Increased expression of caspase-1 and interleukin-18 in peripheral blood mononuclear cells in patients with multiple sclerosis. Mult. Scler. 10: 482–487.
. 2009. Global mapping of H3K4me3 and H3K27me3 reveals specificity and plasticity in lineage fate determination of differentiating CD4+ T cells. Immunity 30: 155–167.
. 2008. Stimulation of Toll-like receptor 3 and 4 induces interleukin-1β maturation by caspase-8. J. Exp. Med. 205: 1967–1973.
. 1998. Generation of biologically active IL-1 β by matrix metalloproteinases: a novel caspase-1–independent pathway of IL-1β processing. J. Immunol. 161: 3340–3346.
. 2000. Interleukin 18 restores defective Th1 immunity to Candida albicans in caspase 1-deficient mice. Infect. Immun. 68: 5126–5131.
. 2009. IL-17A and IL-17F do not contribute vitally to autoimmune neuro-inflammation in mice. J. Clin. Invest. 119: 61–69.
. 1996. Mice with a disrupted IFN-γ gene are susceptible to the induction of experimental autoimmune encephalomyelitis (EAE). J. Immunol. 156: 5–7.
. 2009. T-helper 17 cells expand in multiple sclerosis and are inhibited by interferon-β. Ann. Neurol. 65: 499–509.
. 2002. IL-18 is linked to raised IFN-γ in multiple sclerosis and is induced by activated CD4+ T cells via CD40-CD40 ligand interactions. J. Neuroimmunol. 125: 134–140.
. 1997. Correlation between interferon production and clinical disease activity in patients with multiple sclerosis. J. Clin. Immunol. 17: 293–300.
. 2009. The relation between inflammation and neurodegeneration in multiple sclerosis brains. Brain 132(Pt. 5): 1175–1189.
. 2008. T helper 17 lineage differentiation is programmed by orphan nuclear receptors ROR α and ROR γ. Immunity 28: 29–39.